The thing I love about college basketball is how some teams come into a game with a better record than the team would indicate by the way they play, but tonight a pretty solid South Alabama team came into College Park Center. Hard to believe they’ve only won 7 games this year. But the Mavs were ready with a good defensive effort, taking care of the ball and some good shooting. Mavs shot 46% FG for the game, with a balanced scoring attack: Dowell (21 pts.) hot from outside, McClanahan (19 pts.) driving to the basket with ease and Brandon Edwards (17 points, 11 rebounds) making a couple of threes and scoring inside and at the free throw line. Brandon also had a nice alley-oop. One of the big highlights was Dowell got hot and made four consecutive four 3-point shots in the first half. Very reminiscent of those long-range shooting streaks that Marquez Haynes or Bo Ingram would go on fairly regularly. Unstoppable. A lot of fun to watch. Jorge Bilbao had a nice game–his official scoring stats show only 3 points on 1-of-2 shooting and 1-2 FT with 2 rebounds in 12 minutes…but one of his drives to the basket was more guard-like than most guys his height (6’8)– he had a defender or two totally spinning around as he went to the basket. He also does the things that coaches and fans love but don’t necessarily show up in the box score–working hard for rebounds, diving on the floor to get loose balls, altering shots around the paint. It’ll be fun watching his game develop at the Div. I level. Despite having what appeared to be a pretty tall, strong team, USA rarely went inside for offense and instead elected to hoist a lot of threes (37), making 11 of them for 29%. The Jaguars only got to the free throw line 12 times, making 10 which helped them stay in the game. Rebounds were even at 36. The Jaguars’ Antoine Allen had a very nice shooting game (6-13 overall, 4-10 3pt, 18 points)…one of the better shooters we’ve seen come to play against the Mavs in a few years. Very quick release, and was able to get open on a night where the Mavs were contesting every shot. Impressive individual game. Defensively, this might have been the hardest-working effort the Mavs have had (at home, at least) this season. 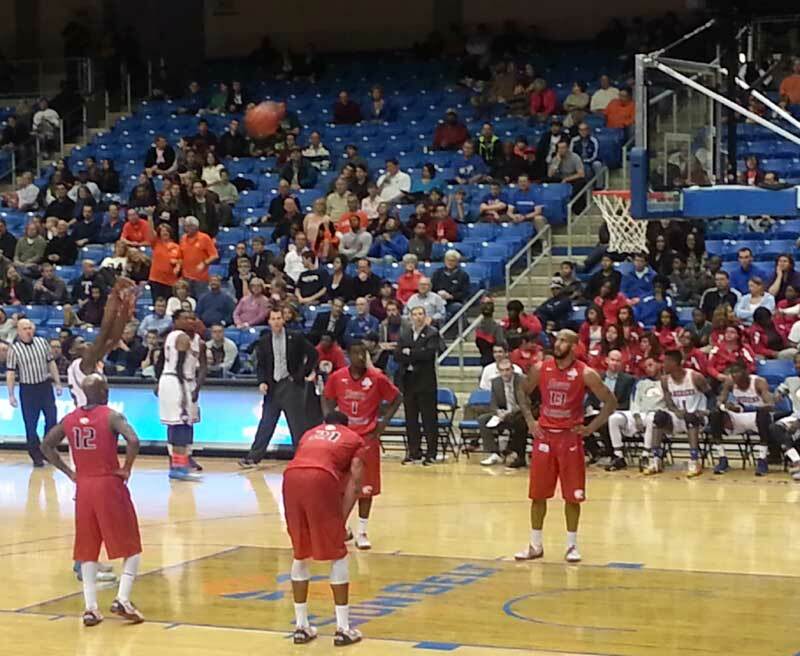 Nothing was easy offensively for the Jaguars, with UTA getting key rebounds and giving USA no good looks inside. The Mavs held their third consective opponent under 40% FG, and that usually leads to wins. Crowd of about 2800 was loud all game. The upper-level seats were curtained off, but the lower bowl was very full and the fans were really into it from the opening tip-off. The Mavs have tough teams coming up but they were able to put some distance between them and a few teams below them. Next up: games against Western Kentucky and Georgia State on the road. 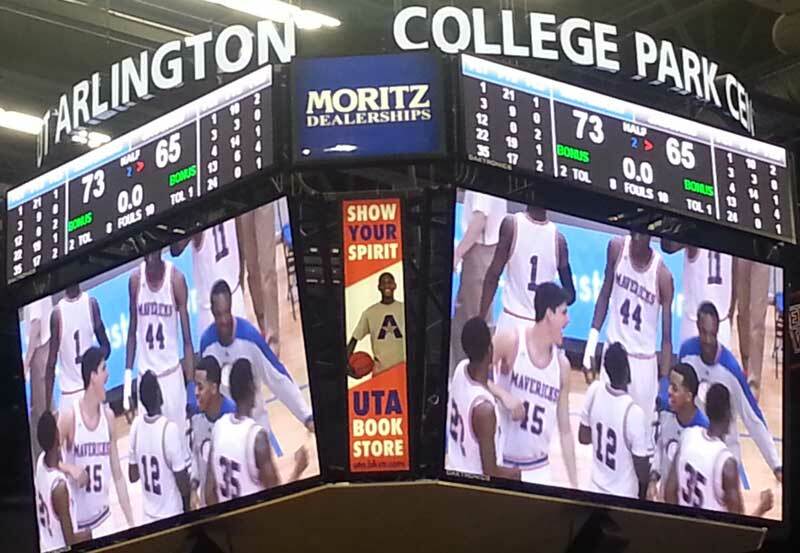 This entry was posted in College Park Center, South Alabama, Sun Belt, UT Arlington, UTA, Win and tagged College Park Center, mavericks, Mavs, South Alabama, Sun Belt, Texas Arlington, win by rustyhancock. Bookmark the permalink.